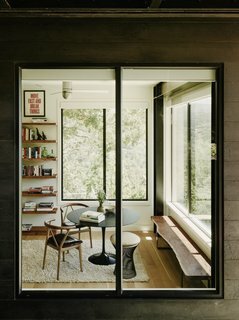 Designed around a specimen oak, this renovated midcentury has walls of glass and a natural palette to achieve a seamless connection with the outdoors. 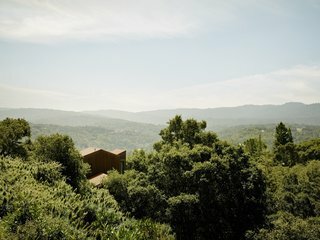 When a pair of nature lovers purchased a hillside midcentury home south of San Francisco in Portola Valley, they were admittedly more taken with the stunning valley vistas than the house, whose original 1960s design had been long covered up by mismatched remodels. Yet, after living there for a few years, the couple decided to start a family and realized a renovation was finally in order. 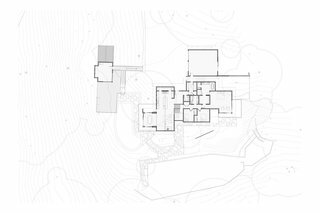 Set on a forested hillside, the home feels completely secluded. The closest neighboring house is 500 feet away and out of sight. 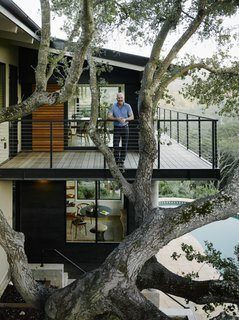 Malcolm Davis stands behind the specimen oak tree on the new cantilevered wraparound deck. Not only was extra living space necessary for the growing family of four, but the existing house also failed to take advantage of the striking views that drew the couple to the site. 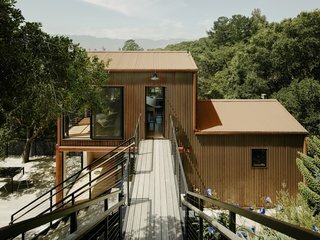 The homeowners tapped architect Malcolm Davis of San Francisco–based Malcolm Davis Architecture to redesign and expand the dwelling without damaging the many established oak trees. The annex lanai opens up to the deck for indoor/outdoor living. A view of the ipe-and-steel bridge from the main house to the annex. 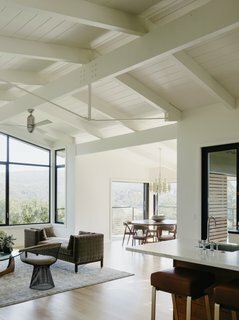 After taking stock of the home’s midcentury elements, such as the original beamed ceilings and relatively open layout, Davis worked to bring greater natural light and a sense of flow to the home. In the main level’s open-plan living areas, Davis removed posts and swapped small windows for walls of glass. A new cantilevered balcony wraps around the dining room, bringing homeowners closer to the specimen oak tree at the center of the site. The architects preserved the existing beamed ceilings, which give the open-plan living area an airy feel. The living area is dressed with a vintage tête-à-tête sofa by Edward Wormley, a Warren Platner chair, and an Isamu Noguchi table. 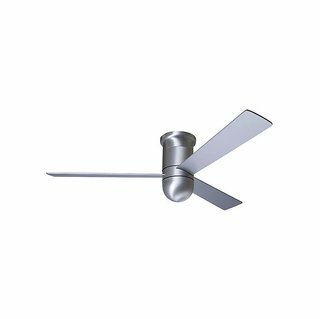 Designed specifically for low ceiling applications, the Modern Fan Cirrus Flushmount Ceiling Fan adds a sleek, contemporary look while providing excellent air circulation at only 13" long. A variety of remote controls are available, as are optional light kits. 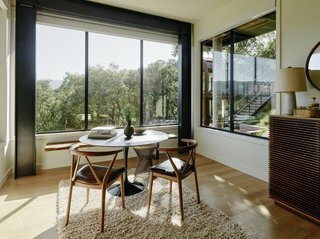 Surrounded by retractable glass doors, the dining area opens up to the landscape. 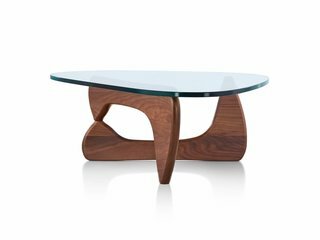 A custom Gianni Corvasce Restoration walnut table is combined with vintage Kai Kristiansen dining chairs and a 1970s brass-and-Lucite chandelier. 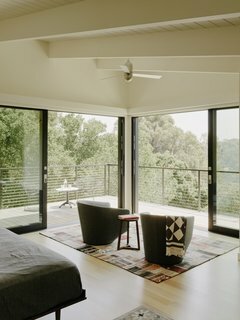 Downstairs, the architects dropped the floor to take advantage of the natural sloping site, bringing additional space, taller ceilings, and greater natural light to the interior. They then repurposed the master bedroom, which had been located on the lower level next to the swimming pool, into a media room. The expanded central kitchen occupies the heart of the home. 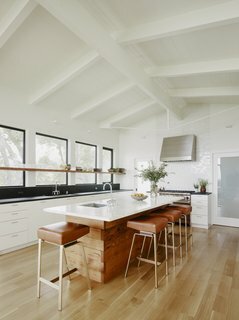 The kitchen island is wrapped in reclaimed Douglas fir and topped with a white granite countertop. The countertops in the rear are black-flamed granite. 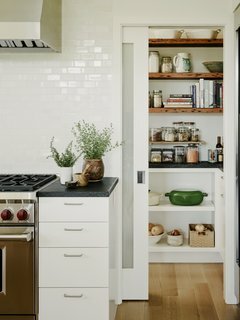 The new walk-through pantry with laminated glass doors runs the width of the kitchen and features reclaimed timber shelving. The floors are engineered oak. Davis relocated the master bedroom to a new wing on the east side of the house, adjacent to the two existing kids’ bedrooms on the upper floor. 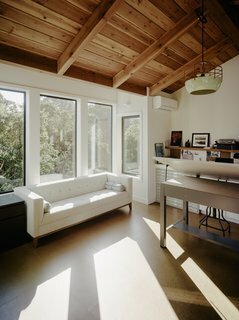 Rather than continue the slope of the gabled roof, the architects created a butterfly roof to bring added light into the master bedroom. The view from the master bedroom. Sliding glazed pocket doors open up to the cantilevered deck. 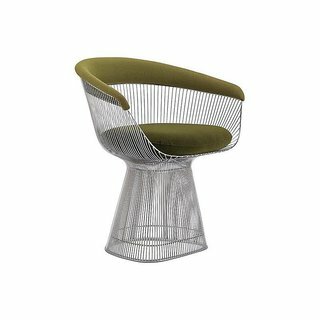 The U-Turn swivel chairs are by Niels Bendtsen from Design Within Reach. The master bathroom overlooks a private garden. The freestanding tub is by Blu Bathworks and the flooring is slate tile. 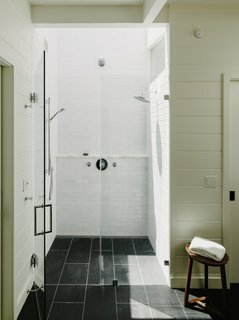 White ceramic Fireclay tile wraps around the shower. 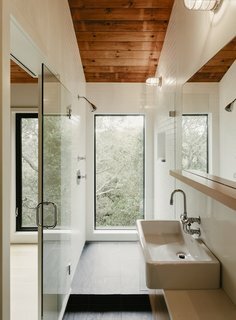 Skylights bathe the master bath in natural light. The renovation also added a new structure to the west end of the property on the other side of a mature oak tree. 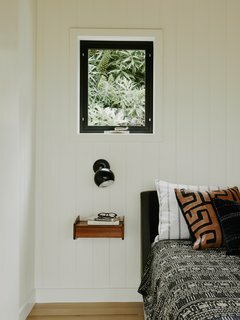 A guest suite and a sitting room, named the lanai, occupy the ground floor, while an artist’s studio sits above and is connected via a bridge to the main house. 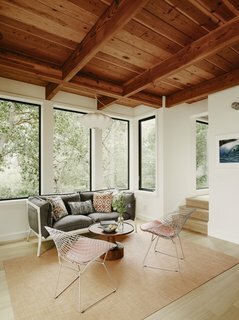 The freestanding guesthouse includes a new sitting area that's dressed with a Blu Dot Grotto sofa, a Blu Dot acacia coffee table, and a pair of Harry Bertoia Diamond chairs. 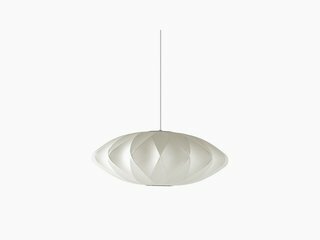 The George Nelson Saucer Criss Cross Bubble Pendant has an intricately patterned frame that peaks through the plastic, creating variation that is beautiful when the fixture is lit or unlit. 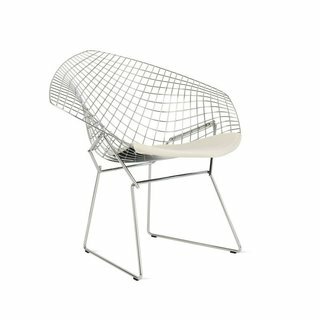 Harry Bertoia's fateful meeting of Florence Knoll at Cranbrook Academy of Art led to his being invited to work for her and her husband, Hans Koll, years later. 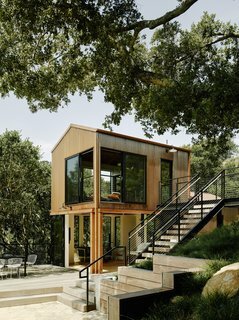 The sun-soaked art studio is elevated into the tree canopy. The water-resistant ipe wood deck wraps around two existing trees. 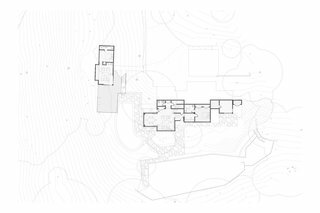 "There is a playfulness to the house," Davis explains. 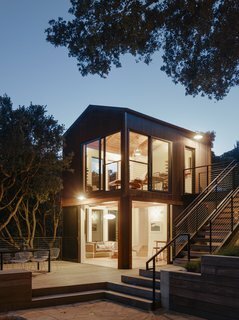 "My clients think of it as a tree house, which is fitting given that their active lifestyle and love of the California landscape naturally merged with my own sensibilities and allowed us to create a relaxed and inviting backdrop for their lives." 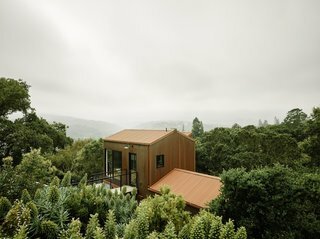 Surrounded by a sea of forest in Northern California, the Portola Valley House features fire-resistant construction. The annex is wrapped with Corten corrugated siding, while shou sugi ban treated timber clads the main house. A peek inside the guesthouse bedroom with a Blu Dot Woodrow bed and RH bedding. 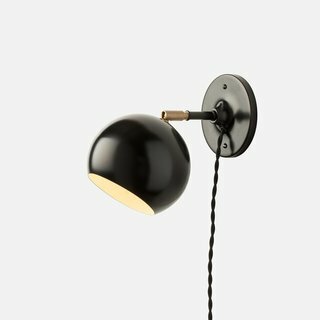 The sconce is a Schoolhouse Electric & Supply Co. Isaac plug-in. We fused the arcing lines of a Scandinavian classic with handcrafted, vintage-inspired materials to create this Schoolhouse Electric Original. 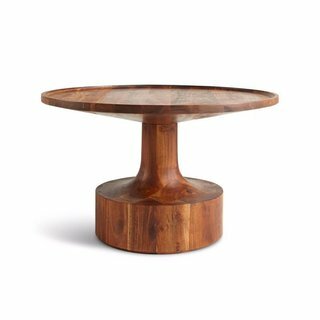 Aspect floats a storage idea that's great for small spaces, freeing up floor space in the dining room, family space, entry or hallway. 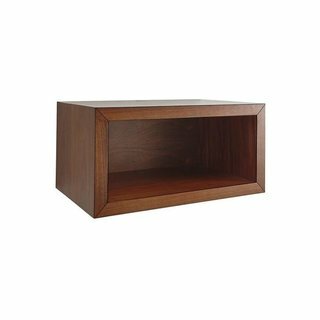 Stained warm walnut brown, the wall-mounted open cube keeps everything right in sight at a height that works for you. Be progressive, just like President Woodrow Wilson. 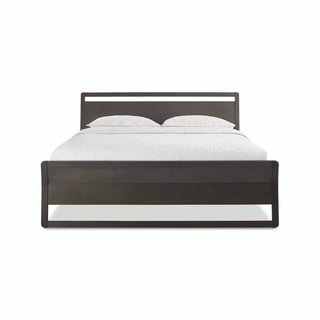 The Blu Dot Woodrow Bed offers graceful lines and gorgeous wood to the contemporary bedroom. The guest bathroom features a full-height window with immersive canopy views. The architects dropped the floor of the lower level to create 10-foot-tall ceilings. The existing den and master bedroom now serve as a media room furnished with an Eero Saarinen table from Knoll, Bruno Hansen chairs, and an Original Timber Co. bench. Beneath the dining area is a small sitting room flooded with light from three sides through bronze anodized windows with automatic translucent shades by Fleetwood Windows & Doors. "At night, this annex glows like a jewel box," note the architects.